How do you go about recreating the work of a genius? 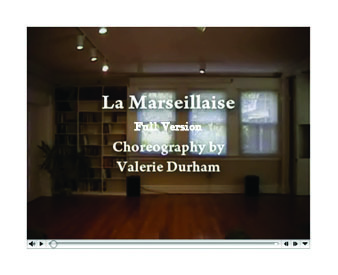 I undertook that daunting and humbling task in remounting one of Isadora Duncan most legendary works, The Marseillaise. In 1915, Isadora Duncan improvised a dance to the French National Anthem as a “call to the boys of America to stand up, and defend the greatest civilization of our epoch” (meaning France.) The dance was an impromptu offering performed on the stage of the Metropolitan Opera House in New York City. The audience response to Duncan’s dance, according to press accounts, was nothing less than staggering. Standing ovations, un-abashed weeping, singing, cheering, and applause for minutes on end. A few years ago, soon after 9/11, when patriotism was high in America, and countries around the world, including France, were rallying to our support, I was asked by a non-profit organization to dance The Marseillaise – Isadora’s Marseillaise – at one of their events. The problem was that The Marseillaise is a lost choreography! There are no pictures or video from performance. Isadora Duncan died suddenly in a tragic car accident in 1927, without filming a single one of her dances (even though the technology was available). Yet today, over 200 ‘authentic’ Duncan choreographies are still performed. How is that possible, when so little documentation exists? The choreographies and technique that have been passed down from Isadora Duncan are actually the work of Isadora’s primary pupils. The “Isadorables” as they were dubbed by the French press, they performed and trained extensively with Isadora. While Isadora was alive, the Isadorables learned the group dances that Isadora set on them. But they also watched and studied Isadora’s own solos, mainly from the wings while performing with her. The first performance of the Marseillaise was performed in New York without any of the Isadorables present, and it was improvised, so no one could even have watched a rehearsal. The dance vanished into the ether as she performed, and when she finished, it was gone. Isadora re-danced the Marseillaise at the Trocadero in Paris, and on tour in South America, but again, her troupe of dancers were not with her, and so did not have a chance to learn the piece. Resultantly, the Marseillaise was not passed down as the rest of the repertory that we have today. I began the process by researching all that had been written about Isadora’s improvisation, from her own account in her autobiography to articles written in newspapers after the event. What I learned there led me to study the sources of inspiration for Isadora. 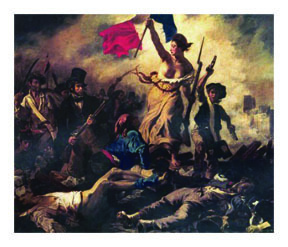 The bas relief images from the Arc D’Triomphe and the figure of Marianne from “Liberty Leading the People” were particularly inspirational for me. I knew from earlier research that Isadora studied the precondition and post-effect of images, and used that as a resource in her dance. I let myself consider her images in the same way. An additional resource was my own experience with and knowledge of other known Isadora choreographies. I have danced her Schubert Symphony #9 Finale, Tchaikovsky Pathetique Symphony, Amazons, and March Militaire as passed through Duncan Dance Masters Lori Belilove, Julia Levien, Hortense Kooluris, Sima Leake, and later Jeanne Bresciani. From these dances and training, I came to understand how Isadora might have expressed this particular heroic, militaristic aesthetic in her choreography, and the musicality connecting those movements. From all of this research and training, I had confidence in my ability to imbue my version with authenticity and truly personal expression. I began to become comfortable projecting an understanding of the type of movements and motivations Isadora may have employed in her choreography. My next challenge was locating a recording of the music that would be appropriate for the Duncan technique and musicality. Isadora’s performance used the first four stanzas of Rouget de Lisle’s text, and a version of the music officially selected by the French government in 1887, which is a bit different from the version we hear today. I listened to multiple versions of the song, ranging from versions performed by child choirs to performances by military bands. I was fortunate to find a truly inspiring version of the Marseillaise, featuring the magical voice of Placido Domingo, conducted by Hector Berlioz. The only problem was that it was all six verses! I decided to choreograph the entire six verses, over 11 minutes in length. The resulting choreography told the story of an entire war. With an initial foray into battle, the rallying cry and scouting of the enemy troops, the actual engagement of fighting results in soldiers falling, until the solo dancer is the only one left standing. She calls to God, and raises her fallen comrades to charge again, this time victoriously defeating the enemy. Throughout the piece, the choreography incorporates gestures of a flag being held, carried and waved, which represents a rousing and patriotic image for the troops in the battle. By utilizing the steps of 1) research, 2) knowledge of the technique, 3) proper music, 4) personal artistry, and 5) a hefty dose of audacity and humility, I have created a dance that honors the tradition of Isadora’s genius choreography. While I can never know what Isadora’s exact movements were that amazing night at the Met in 1915, I feel confident that I have created a dance that approaches the types of movements and the kinds of emotions Isadora would have pursued in that effort to inspire that New York audience. For this year’s presentation at the Capital Fringe Festival in DC, I condensed the longer work that I created into a one-verse iteration. 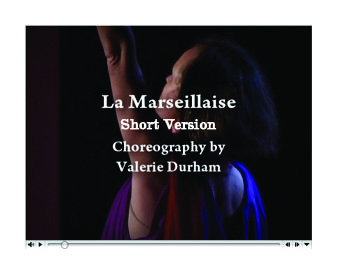 The shortened dance lacks the dramatic story of the longer one, but captures the enthusiastic call to action that initially inspired Isadora to improvise the French anthem. Valerie Durham is a 4th generation Duncan Dancer, and the Artistic Director of The Duncan Dancers. She offers classes in the Duncan Technique at the DC Dance Collective. Visit www.duncandancers.com for more information. Absolutely loved reading this story of your creative and artistic process, Valerie. And the long version is fantastic–can’t wait to see it live one day!